Antiwar.com reported today that former Saudi intelligence chief has called for a nuclear weapons-free zone in the Middle East. Prince Turki Al Faisal urged the five permanent U.N. Security Council members to guarantee a nuclear security umbrella for Mideast countries that agree to a nuclear weapons-free zone and impose sanctions on countries that develop or maintain nuclear weapons. Though it is clear that an Iranian nuclear weapons program would certainly be a concern to Saudi Arabia, it also must be mentioned that the opinion of the U.S. intelligence community, the Obama administration, and the latest IAEA report is that Iran’s enrichment is so far civilian in nature. It seems as if Israel and its relentless lobbies are the biggest threat to world peace. Hasbara author (1) David Aaronovitch is pretty much unstoppable. The man who together with the Jewish Chronicle writer Nick Cohen encouraged the war in Iraq, is now warning us about the evolving Iranian bomb. “Wake up”, he urges us in The Times, “this threat is too big to ignore”. As if more than one million Iraqis killed in a war he advocated were not enough, the enthusiastic Hasbara author has a new conflict to propel. 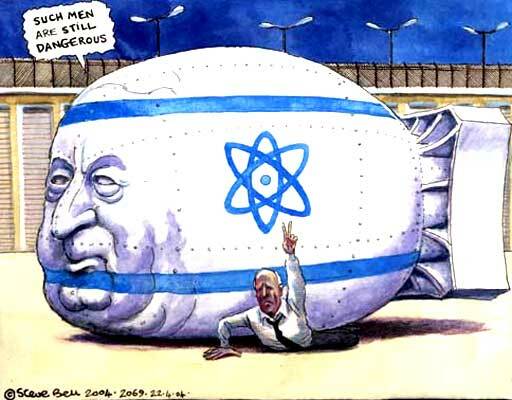 Demonstrating that the continued attacks being made on Iran, by presidents, prime ministers and the mass media, are smokescreens for the real danger to world peace: Israel and more lies about weapons of mass destruction. Commentators from the mainstream media accept just about anything that is fed to them, by the White House or favoured politicians, and repeat it, like parrots, to their mass audiences, whether the information is accurate or not. "The International Bureau of Double Standards" is, of course, a euphemism for the way that the New World Order operates, and, unless we all learn to see through the lies, half truths and damaging innuendo, we will only have ourselves to blame for the way our futures and those of our children are affected. The question of "who is a Jew?" has been debated in Israel since it attained statehood. In the Jewish state the authorities, Rabbis and the media would dig into one’s bloodline with no shame whatsoever. For the Israelis and orthodox Jews, Jewishness is obviously a blood related concept. However, Jewishness and blood concerns are becoming a subject of a growing debate in the UK. In the last few days The Daily Telegraph and The Guardian are trying to decide whether Iranian President Mahmoud Ahmadinejad is a ‘self hating Jew’ or just an ordinary anti-Semite. Like the Israeli Rabbis they both dig into his bloodline.